If you’re still struggling to come to grips with the best way for your organization to reach people with Facebook – and who isn’t? 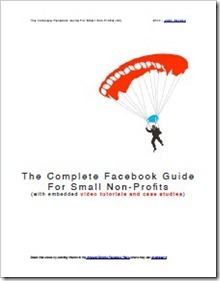 – John Haydon’s free ebook The Complete Guide to Facebook for Small Non-Profits is for you. Do we need a Facebook Page or a Facebook Group? How do we measure engagement with Facebook Insights? How do we put a Facebook Page Fanbox on our non-profit’s website – and how can we customize it? How can we get our Facebook fans to donate? What the heck are “Community pages”? To download your free copy of The Complete Guide to Facebook for Small Non-Profits, just visit the InboundZombie Facebook Page and hit the “Like” button to reveal the download link. p.s. Notice what John’s done there? The download link only shows up for those who “Like” his Facebook Page. It’s called “creating an incentive” – in much the same way as your membership website might have a private section that’s a benefit for members only – and you can do the same for your non-profit’s own Facebook Page! To learn how, see page 53 of the guide. Rebecca - Thanks so much for posting this! Funny - the Captcha below actually asked me to type "Mr Promos". No kidding! It is great to see some people helping out some small non-profits, I am happy to see someone helping out those who are doing good in the world. I will pass along this offer to a few friends who are starting non-profits. Rebecca and John - Thanks so much for this resource! I have a technical question. I accidentally created a profile from my nonprofit page. I'd like to hide it so that I get "Like"s on our official page instead of people requesting to be friends for the nonprofit's profile page. Any suggestions? I've spent hours trying to find the answer and can't figure it out! Thanks for your help! Go into the Privacy settings of the Profile and select "customize" for each item. Within the "customize" window, pick the selection that says "Only Me". If you select "only me" for every single item, no one will be able to find the Profile. You should also add yourself (Katie's Profile) as an admin on your Facebook Page. This will allow you to reach out to your Page connections on a personal level where appropriate. Katie - Just following up to see how things worked out with your Profile question.